Whether your institution is developing a STEM program, making the world healthier, improving patient diagnostics, or attempting to solve complex analytical challenges, E&I can supply the most effective and efficient scientific solutions. We take pride in connecting you with a wide selection of scientific contracts that include especially relevant products and services to inspire the groundbreaking discoveries of tomorrow. As long as your institution is an active E&I member, you can access any of these contracts and begin saving immediately. Each of our contracts has been created specifically with direct input from our contract specialists, therefore ensuring purchase convenience and comprehensive support. See for yourself why partnering with E&I for lab products is the smart choice! Our Research and Academic Healthcare resources can help you maximize your budget and improve laboratory productivity. We also provide technical support for scientists to tackle society’s most pressing challenges. Our suppliers’ reputations have been built on product quality, flexible manufacturing abilities, and industry-leading service, so check out the E&I Research and Academic Healthcare Portfolio today! The primary focus of our Scientific Strategy Team is to contribute valuable advice and expertise in endeavors that address current and future strategies for institutional procurement of science supplies. The team was created in 2007 as a result of recommendations from the E&I membership and includes representatives from many of the country’s top research institutions. The team meets via teleconference an average of every three weeks and also meets in person two times a year. 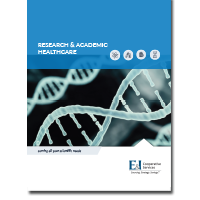 For more information on E&I’s Research and Academic Healthcare specific agreements, please contact E&I’s Portfolio Support Executive – Research & Academic Healthcare, Michael Costigan.